Henrik Jakobsson's Special Currant (Vinbär) portion snus is a seasonal release highlighted by black currents, a touch of sweetness and the distinctive tobacco favored by Jakobsson’s. A few times a year Henrik Jakobsson of Gotlandssnus releases a special snus, usually tied to the time of year. Special Vinbär Portion Snus is a great example of this. Try it and if you love it, buy some rolls for the freezer because this snus will only be around for a few months…maybe less. 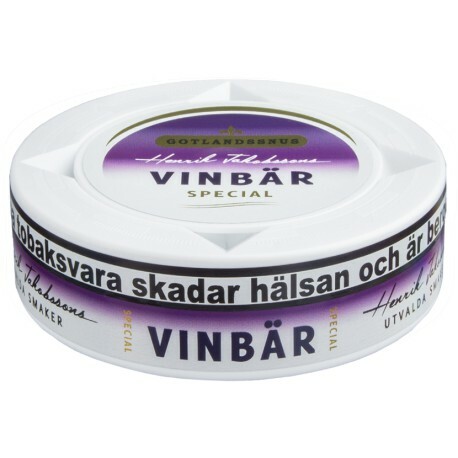 As you would expect, Jakobsson's Special Vinbär Portion Snus can be found fresh, priced great, and shipped lightening fast at the famous SnusCentral.com Snus eShop for as long as we have it in stock. I, Manager Moe Unz, guarantee it! *VERY* moist, but it doesn't make for an overbearing drip. The flavor is wonderful - obviously berry-focused with a later trail of tobacco. Overall, very complimentary. The nicotine kind of surprised me - not in a bad way. Overall it's a great summer flavor that's sweet, but not too sweet. I'm glad I bought a roll, as I'd be very likely to order it again.